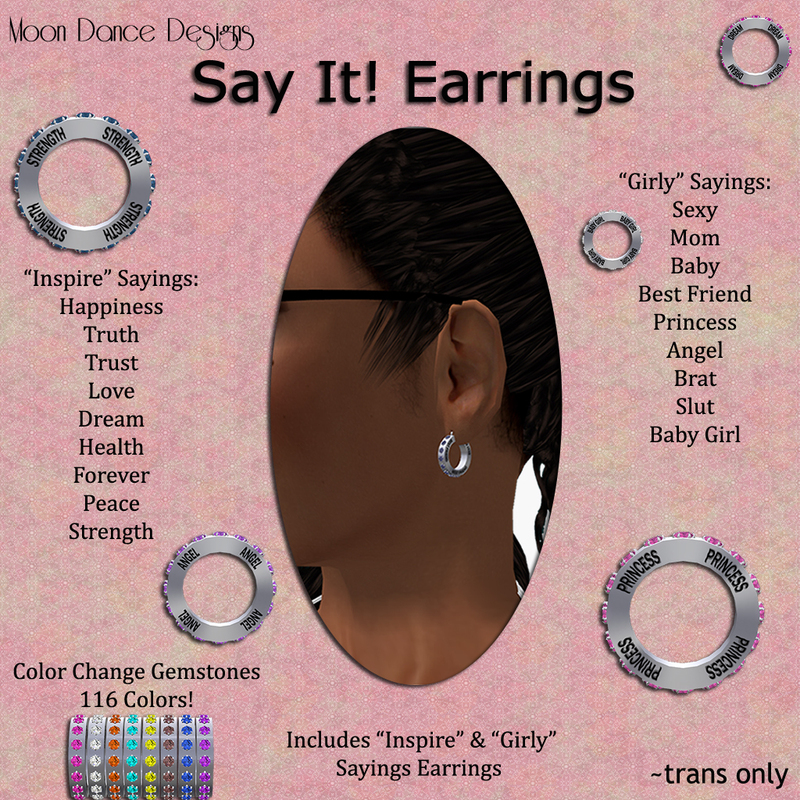 Moon Dance Designs New Sim! Please drop by and see the new shop and surroundings. 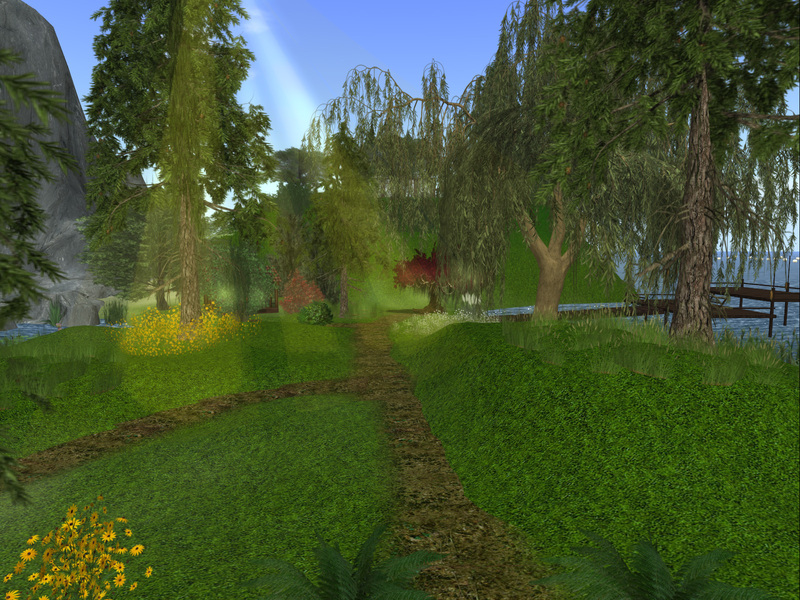 I have created plenty of places to enjoy after shopping…places to cuddle, dance, chat and even comtemplate *smiles* Please update your landmarks, and keep an eye on notices for our GRAND RE-OPENING, coming soon! Now onto the goodies! I’ve re-worked a few pieces at customer’s requests…Hope you enjoy the revisions! And a new setting for the Pink Frills set…Purple Abalone! 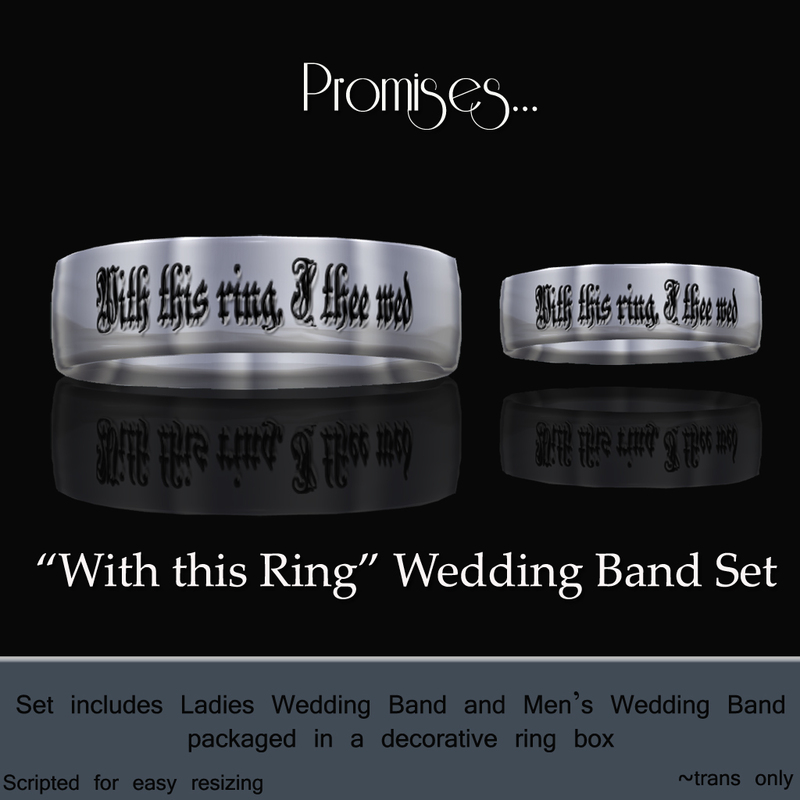 Be sure to say tuned for a revamp of the Promises…. line and area of the shop…I will be adding demos of all the wedding sets. Also offering MORE to make your special day, even more special! I’ve also planned a discount area for older items (to make room for all the new glitter!) and group members only purchases! Don’t forget that Moon Dance Designs participates in the 60L Weekends each week! The list of participating shops grows each week….a shopping experience not to be missed! A 60L Weekend kisok is also in shop so you never miss a notice! Remember the Midnight Mania board and the subscriber! Hi all! Wow! I took a bit of a building break after Valentine’s Day! But I’m back! With a few goodies and upcoming revamps in the shop! On to the goodies! First up, is cute, Springtime pieces….necklace, earrings and a right-hand ring. “Say It!” says it all! Cute metal ring engraved with inspiring or girly sayings! 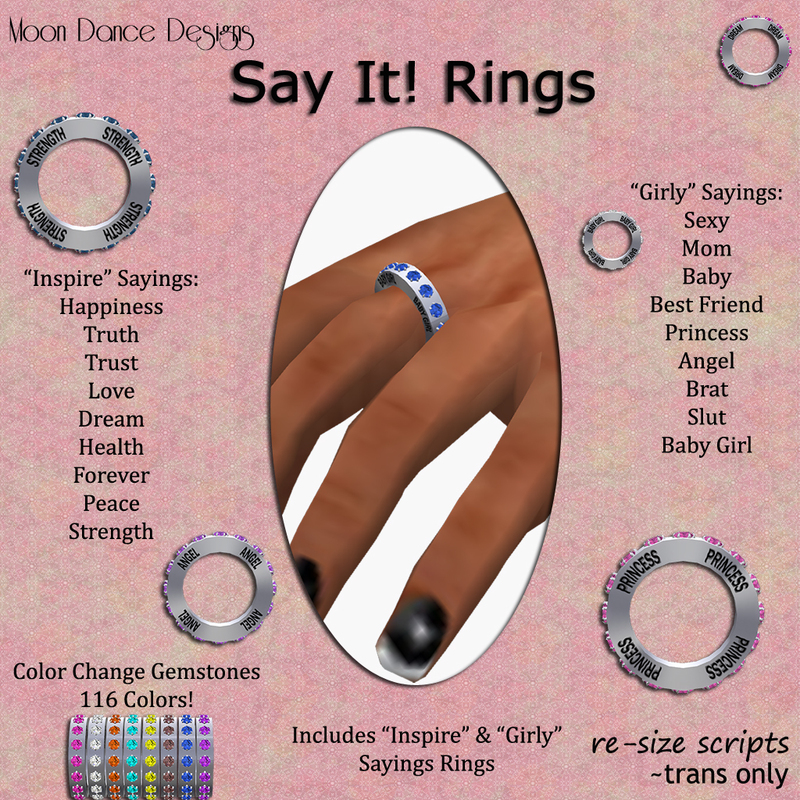 The rings are gemstone encrusted, that are also color change…116 colors in all! 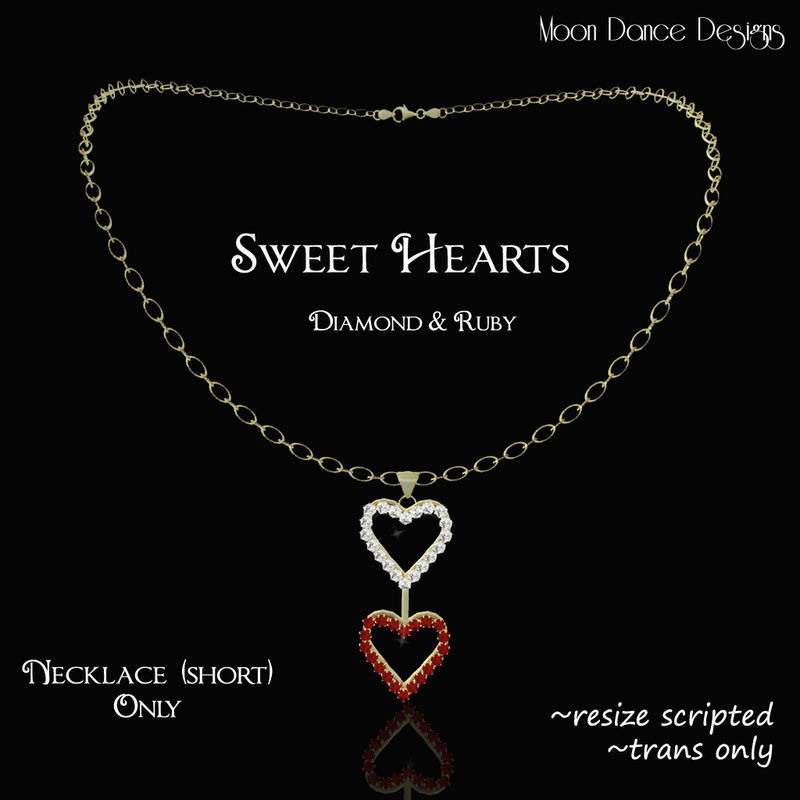 The necklace comes in a two piece set…the smaller having the “girly” sayings, the larger one, having the “inspire” sayings. The necklaces can be worn together or separately! Matching earrings and ring is also available. The “Say It!” pieces can also be customized with your favorite sayings! Information is available in shop!